The graph view lets you view and edit animated parameters as graphs of their values over time. It is one view of the animation editor. You can also use the table view and the dopesheet view to edit animation. To switch between these views, use the buttons in the top left corner of the pane. A channel contains a series of segments. Each segment has two end points. Each endpoint is at a key and has the following properties: value, slope, and acceleration. The segment as a whole also has a segment function associated with it and, depending on what it is, will use any number of the properties at the end points. For example, the constant() segment function uses the "value" of the first end point only, while the bezier segment function uses all three (slope, acceleration, and value) at each end. Drag to zoom and to pan. To pan and zoom so all graph data is visible, click the Home graph icon in the toolbar on the left side of the graph, or choose View ▸ Home All Graphs. To show all data, choose View ▸ Home All Views. To have Houdini automatically pan and zoom so all data stays visible as you work, turn on View ▸ Horizontal Adapt and/or View ▸ Vertical Adapt. A tall white vertical line on the graph indicates the current time. Drag the line to change the time. Drag with to hold the values of the parameters in the Channel List. Click or drag in the blue frame number area at the bottom of the graph to move the play position to that point. You can also use the regular playbar controls . Click the graph with Alt + to create a new keyframe at that frame. This will only work when adding keyframes to existing channels. You can also hold the button down and drag the insertion point along the curve, allowing more accurate positioning. If a key already exists on a selected channel, this will not create a duplicate key. ⌃ Ctrl + K with mouse over the graph adds a keyframe for the selected channels. K or on the playbar keyframe button adds a keyframes based on the Global Set Key animation preference. Alt + on a parameter edit box adds a keyframe as well, but only for the selected boxes. on the graph and select Set Keyframe at Current Time. on a parameter and select Keyframes ▸ Set Keyframe. Select the key handle and press ⌦ Del. on the graph and select Delete. on a parameter and select Keyframes > Remove Keyframe. You can select a segment and choose the "segment function" to control how Houdini connects the two ends of the segment. 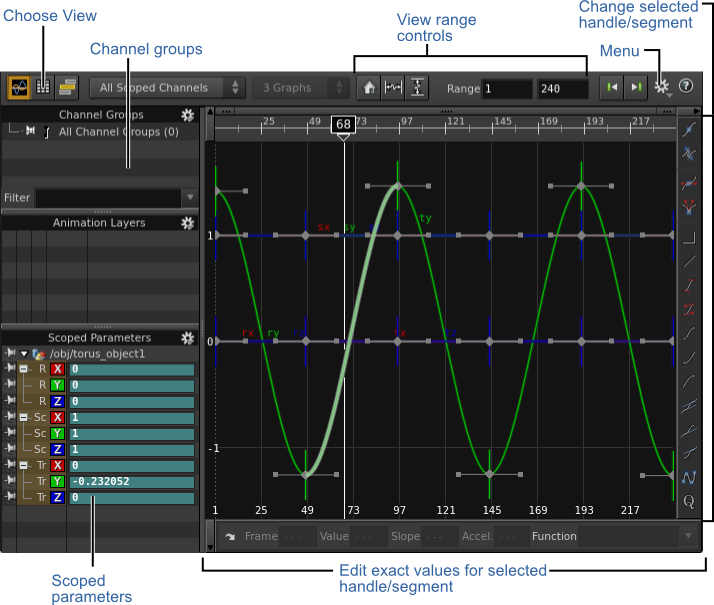 You can use automatic or manual control of slope, and tie or untie value, slope, and/or acceleration at each keyframe. Select the segment you want to change. If segments are drawn as dashed lines, turn on the "functions" icon on the toolbar to the left of the graph to make segments selectable. Choose a function from the pop-up menu at the right end of the Function text box below the graph, or type a custom expression into the Function box directly. You can also change the shape of the graph segment by clicking the desired function button on the Functions toolbar. Use the handles (if any) on the selected keys in the graph view to adjust the shape of the curve. Press Y to switch to a scale handle. For the cubic, bezier, and quintic functions, you can adjust the shape of the curve by dragging the slope handles on keyframes, or by clicking the handle and typing a value in the Slope text box. For the bezier and quintic functions, you can also drag the round acceleration handles at the end of the slop handles, or by clicking the handle and typing a value in the Accel. text box. You can also type exact numbers for the selected handle in the Slope, Accel. (acceleration), and Value text boxes below the graph. Drag the short vertical line that runs through a value handle left or right to move the keyframe. Time values on the graph have a dashed line under them. When you turn on the Snap to Frame option, keys will move to the nearest frame time when you finish dragging. Select a keyframe and press 0 to zero the slope, or 9 to make the slope tangent. Select the keyframe and use Alt + C or ⌃ Ctrl + C to copy it, move along the timeline, and use Alt + P or ⌃ Ctrl + P to paste a copy of it. Drag a keyframe handle up or down. Click a keyframe handle and enter an exact number in the Value field below the graph and press Enter. Use ⇧ Shift + to select multiple handles, or drag a marquee around the handles you want to select. The you can drag one selected handle to move them all. If you select more than one value, the Value field shows ---. Edit the field to set all selected values at once. Hold ⌃ Ctrl and drag the value handle. Hold ⌃ Ctrl and drag the acceleration handle. ⇧ Shift double-click the handle. ⌃ Ctrl + ⇧ Shift double-click will remove of the same type of handles from the selection. Hold ⇧ Shift and drag . ⌃ Ctrl + ⇧ Shift and drag will remove handles. To access the following menus, click the gear menu on the top right corner of the Channel graph. You can also access these menus by clicking in the graph, or by turning on Show Menu Bar in the View menu. When a channel is displayed, it means that it is visible for viewing/editing in the animation editor’s graph, table, and dopesheet panes. Adds keyframes to the channels at the current time. Copies the values of the parameters at the current time to the clipboard. Move to a different time and choose Paste sampled values at current time to use the same values at another frame. Pastes values copied with Sample values at current time. Opens a dialog to load previously saved animation data from Export Displayed Channels into the parameters which are currently displayed. This brings up a dialog that allows you to save the data from the displayed channels. Displays only the selected channels. This is the opposite of Isolate Channels. Instead of displaying only the selected channels, this causes all channels to be displayed. Cuts, Copies, or Pastes all selected handles using the Paste Settings. Channel copy and paste works by storing the selected channel handles in a temporary file. The animated range, channels names, full paths, and row order based on the currently displayed channels are also stored in file. This information can be used to perform a mapping between the copied channel list and the target channel list. Channel mapping is performed based on channel names. This works well to transfer animation from 2 nodes of the same type with the same parameter layout. Use this with caution when copying multiple transform nodes at the same time, as it will only paste the first occurrence of the channel name. Channel mapping is performed based on full paths. This works well when doing copy/paste to and from the same channels. It will behave correctly even if the list of channels is changing. This mode won’t allow copy/paste to be used to transfer animation from different channels. Channel mapping is performed using the row order in the displayed channels at the moment of the copy operation and the row order at the moment of the paste operation. It counts parameters without valid channels to make it possible to copy/paste to a node without any channels, or a node with a different set of channels. Paste the copied handles after at the current time. Paste the copied handles at their original time. Paste only on parameters with existing channels. Paste on all the displayed parameters creating missing channels. Selects all the handles on the displayed channels. Selected handles become unselected. Unselected handles become selected. Each selected key, is rounded in time to the nearest integer frame. Tie locks the left and right channels together (changing one changes the other). When channels are untied, you can alter the left and right channels independently. Sets the values of the selected keys to their default values. The actual values depend on the parameter of the channels. Sets the selected slopes to have a value of 0 (ie. flat horizontally). This controls the new Automatic Slope flag on in and out slopes. When the auto slope flag is Automatic, moving a keyframe value or time will affect the tangent and will keep it smooth. When the auto slope flag is Manual, the slopes will keep the same orientation when moving keyframes. Keyframes with their slopes set to automatic are drawn as diamonds. Sets the value of the selected slopes so that there is no overshoot. The slopes of keys on the channel for which it is a local minimum/maximum will be set to 0, while all other slopes will be given an approximate value that will result in a smooth transition between its adjacent keys. Smoothing also normalizes the acceleration values. Allows you to change the segment function. See the Function field section for more information. The Euler filter fixes bad rotation interpolations that happen when animating rotations using Euler angles over large angles. A common issue is the rotation flipping the wrong way between the keyframes. To apply the filter, select any handles on all 3 rotation channels and apply the filter. The filtering operation is applied to all the channels that have a selected handle and it affects the whole channel. The Rotation Order on the object node affects the filtering operation. The filter should only be used on rotation channels. Rotations from multiple objects can be filtered at the same time. Creates missing keyframes on channels based of selected time marks. This ensures the channels have matching keyframes within the selection. Shows a modal dialog with options to perform a cubic() curve refiting and resampling on the selected segments. Resampling allows segment expressions and CHOP exports to be baked to keyframes. Channel extrapolation (cycles, cycle offset) can be baked to keyframes, if you provide a range that is outside the channel first and last keyframe. Enable/disable the refitting. Refiting reduces the number of keyframes while trying to keep the same curve shape. Preserves the local minimas and maximas. Even if the refitting creates cubic curves, this forces the segments to be bezier segments. The tolerance used to merge keyframe values. It is an absolute value and should be picked based on the actual keyframe values. Enable/disable the resampling. Resampling adds keyframes without changing the curve’s shape. Adds keyframes at every n frame or fractional frame. Tolerance used to merge keyframes while resampling. Enable/disable the explict range. If disabled, the channel ranges comes from the selected segments. If enabled, the channel range is overriden by the start and end values. This is useful to bake channel extrapolation, CHOP exports and expressions. Defines the start and end frame range to use when Enable Override Range of Selected Segments is checked. Defines what to do when a parameter is driven by a CHOP export. Perform the baking but leave the CHOP export flag in place. The parameter will still be driven by the CHOP export, but the baked animation will be present on the channel. Perform the baking and disable the CHOP export flags on all the CHOP nodes. This doesn’t take into account the possibly that the CHOP nodes can be exporting to other parameters. Use it only when you know you are baking all the channels exported from a CHOP node. Perform the baking and create Delete CHOP nodes to disable the exported channels individually. Pans and zooms the graph to show all keys in the current graph or all graphs. Zooms the graphs to the playback range. The playback range is the range between the Start Frame and End Frame. Adjusts the zoom of all the channel graphs to show the .hip file’s global animation range. Adjusts the zoom of the channel graph to show only the selected keys. When these checkboxes are turned on, the graph automatically pans and zooms to keep all horizontal and/or vertical values visible. Show or hide handles at keyframes. You can drag the handles to change the parameter value at that keyframe. If the values at the key are tied together, the handle is a box, otherwise it is two independent triangles. Show or hide short vertical lines indicating keyframes. You can drag the keyframe lines left or right to move the keyframe in time. Show or hide short lines indicating the slope and acceleration of segments as they enter and leave a keyframe. You can drag the slope lines and/or acceleration handles to change the shape of the segment (for segments controlled by functions that use slopes and/or acceleration). Allow or disallow selection of segments so you can change the function that controls their shape. Show or hide time groups. The time group is displayed as a vertical yellow line. Handles that belong to the time group have a dotted yellow line connected them. Dragging the time group line left or right moves the grouped keyframes in time. Displays a vertical line on the graph which indicates the current frame. Displays handles that let you translate and scale blocks of keys. You can also turn this on by selecting a group of keys in the Channel Graph an pressing Y. You can drag the edges of the box to translate the group of keyframes from side to side or up and down. The axis is locked, so you can only move the keyframes in one direction at a time. To move in both axes together, hold ⇧ Shift when dragging the edges of the box. To scale, select and drag a corner of the box. Displays a pivot handle at the center your box handle. You can also turn this on by clicking ⇧ Shift + Y in the Channel Graph. Any scaling will be done around the pivot location. To move your pivot, simply drag it to another location. To move it back to the center, click ⇧ Shift + Y + Y. This will turn the pivot off and then on again, moving it back to the center. Choose whether all handles or selected handles are displayed on the graph, or turn all handles off. Displays the full name of the channel in the graph. For example: box_object1/tx, box_object1/ty, box_object1/tz. Displays the name of the channel in the graph. For example: tx, ty, tz. Displays the frame number for selected marks. Displays the graph value for selected keys. When this option is on, the graph only shows time groups which have visible keyframes attached. Draws a horizontal dotted line after the end of the last keyframe. If you have scripted a custom coloring scheme using hou.ChannelEditorPane.registerColorsCallback(), you can turn on this menu to select it. Displays the channel lister on the left side of the animation editor. You must have this checkbox enabled to see the group list, channel chooser, and parameters. Displays the channel chooser in the channel lister on the left side of the animation editor. Displays the group list in the channel lister on the left side of the animation editor. The group list shows all channel groups. Displays the Animation Layer Editor in the left pane. Allows you to see the menu bar at the top of the pane. These options are also available in the gear menu. Allows you to hide the toolbars from the display. These are on by default. Creates a temporary channel copy every time the keyframe animation changes. This can be used to quickly revert a keyframe animation to its previous state. Keeps the snapshot when the channel editor refreshes to show new channels. Returns the keyframe animation to its snapshot state. Interchanges the keyframe animation and the snapshot state. Clears the snapshot or accepts the modification. A time group is a collection of keys. A time group makes it easy to move keys through time together. In the pane menus choose Time Group ▸ Create Time Group on Selected Keys. Shift-select the time group line. Drag the yellow time group line left or right. Drag the time group line with . Click the yellow time group line. If enabled, a graphical representation will be shown in the bottom portion of the channel graph of the currently loaded audio source. Adjusts the channel group selection to match the current channels. Choose the density of the grid or turn the grid off. Allows you to set the length of the slope handle in the channel graph. The preset lengths are short, medium, and long; however, you can also set a custom length by choosing Custom. Choose the accuracy of the curves. Lower levels of detail can be faster for very complex graphs. Minimum detail does not draw curves, just lines connecting keyframes. Customizes the behavior in the channel graph when Alt + is used to create keys. If set to At Mouse Click Position, the new key on the channel will be created at the value where the mouse is in the graph. 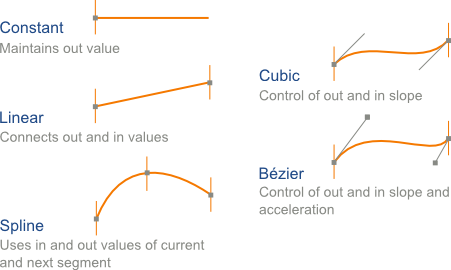 If set to At Curve Value, the key is created at the current value of the channel. Choose if and when you want your slopes to be automatically smoothed. Smoothing also normalizes the acceleration values. Toggles the auto slope preference, which defines the auto slope flag of new slopes when creating keyframes. If enabled, moving keys in the channel graph will ensure that they are always moved to an integer frame value in time. If enabled, scaling keys in the channel graph (ie. using the scale handle) will ensure that they are always moved to an integer frame value in time. If enabled, keys at non-integer frame values in time will be drawn in bold and white. Resets all channel settings to their factory default settings. The frame number of the selected key or time group. If more than one key or time group is selected, the field displays ---, and editing the field sets the value for all selected keys. The numeric representation of the selected key’s in or out value. The slope of the selected key’s in or out line. This is only valid for functions such as cubic that use slope values. The acceleration of the selected key’s in or out line. This is only valid for functions such as bezier that use acceleration values. A segment’s function controls how Houdini interpolates between keyframes. Choose a function from the pop-up menu at the right end of the text box, or type an expression function directly in the text box. Uses the in value for the entire segment, and jumps to the out value at the end. Generates a straight line between the in and out values, animating the value with uniform speed along the segment. Generates motion that gently accelerates the value at the beginning of the segment and decelerates it at the end. The value starts the animation at rest and ends at rest. Generates motion that gently accelerates the value from rest at the beginning of the segment and continues accelerating until the end. Generates motion that gently decelerates the value to rest at the end of the segment. These are fundamentally the same as the ease functions, but are raised to the power 2, resulting in steeper slopes. You can manually change the power in the Function text box (for example, to 3, 4, 5, etc.) to further steepen the curve. Makes the slope of the out curve equal to the slope of the in curve. In the example above, the segment to the right of the key used a Cubic interpolation function. After selecting it and altering its interpolation type to Match, its slope adjusted to match the slope of the curve segment to the left of the key. See the expression reference pages for these functions. Gives you control over the in and out slopes. Gives you control over the in and out slope and acceleration. Like the bezier function, but uses a higher-order curve. Generates a spherical linear interpolation in quaternion space between the in and out values. This is the default for rotation channels. This function is intended for rotation channels. Make sure all three rotation channels use qlinear() and all have keys in the same frames. Segments with quaternion interpolation will display as straight lines in the graph editor, because their intermediate values expressed as euler angles are mostly meaningless. If you're curious you can use the expression qlinear() + 0 to fool the graph editor into showing the actual values. To perform a quaternion based interpolation between two key frames, the qlinear() function needs to know the three euler angles. It does this by figuring out what the neighboring channels are. This is accomplishes this through the heuristic of looking for channels ending with x, y, or z, or by looking for channels ending with a number. Thus, "rx ry rz" will be one group, and "test0 test1 test2" would be another.